The 5th annual Africa Women Innovation and Entrepreneurship Forum (AWIEF) conference, exhibition and awards are now open for registration. The event aims to promote and accelerate the growth of women-owned and women-led businesses for Africa's inclusive economic growth. 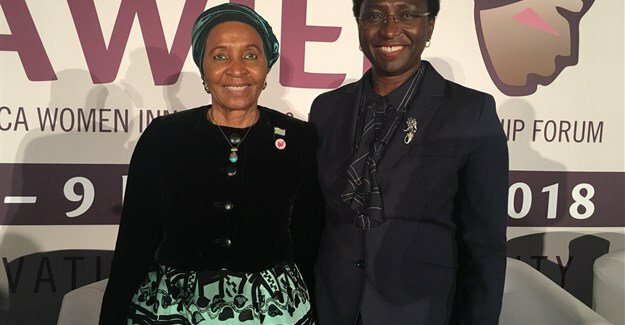 (L-R): Zanele Mbeki, former First Lady of South Africa and Irene Ochem, AWIEF founder and CEO. Credit: AWIEF. AWIEF announced the dates for its prestigious annual conference and awards, which will take place at the Cape Town International Convention Centre (CTICC), 29-30 October 2019. The conference theme this year is, Enhancing Impact: Digitalisation, Investment and Intra-African Trade. The two-day event aims to promote and accelerate the growth of women-owned and women-led businesses for Africa’s inclusive economic growth.